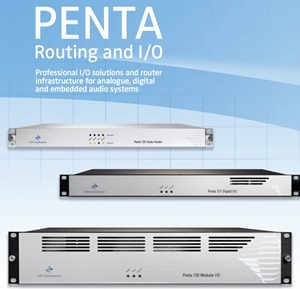 PENTA 721 is a new generation audio router and audio distribution interface from NTP Technology, which provides a versatile and flexible interface for signal distribution of digital audio via AES/EBU and MADI as well as routing via IP Gigabit Ethernet and optical fibre networks. PENTA 721 is a compact 1U digital audio interface designed for stand-alone use in recording studios, radio stations and stage venues. It comes with eight channel AES/EBU input/output channels, MADI and two IP Audio Ethernet in/outs as well as a mini-module slot for ST optical MADI connection or dual SFP MADI optical in/out. The PENTA 721 IP Audio protocol is based on the robust tried-and-tested Dante™ digital audio network technology, and will interoperate with products of other brands that comply with Dante. The Dante IP Audio format provides fast, flexible, and economical audio routing via IP and is compatible with NTP PENTA 720 Modular I/O and other Dante devices. The IP Audio routing provides Low latency, tightly synchronised, transport of uncompressed audio over Gigabit IP Ethernet Layer 3 networks using off the shelf switches, and routers for audio routing via one or more sub-nets. A total of 512 channels can be routed on a 1 Gigabit network, and more if the network capacity is higher.